A heartfelt history of Armed Services Edition paperback books that helped save the sanity of many GIs in World War II. Molly Guptill Manning (The Myth of Ephraim Tutt) opens When Books Went to War by documenting the horrified response in the United States to Nazi Germany’s book burnings, beginning in 1933. Bibliophiles fought back in what was characterized as a “total war” of both military might and ideas. To supply bored, lonely troops with reading materials, librarians in the U.S. organized the Victory Book Campaign, which collected more than 10 million books. To educate the public, the Council on Books in Wartime recommended relevant, topical titles for readers at home, but it found its stride with Armed Services Editions (ASEs). These pocket-sized, lightweight paperbacks, designed for use in the field, not only provided entertainment, escape and enlightenment to American servicemen, but also revolutionized the paperback book in a market that had previously shunned it, employed struggling publishers and helped to jumpstart the publishing industry after the war. Between 1943 and 1947, more than 120 million copies of more than 1,200 fiction and nonfiction titles were printed and efficiently distributed to American soldiers in every theater. In her moving history, Manning fervently describes the many GIs who returned from war with a love of reading they hadn’t had when they left home, wrote impassioned letters to authors and council members and attributed their college educations to books they discovered as ASEs. 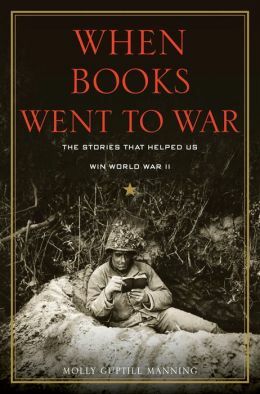 For military and general history buffs and lovers of books and libraries, it is difficult to imagine a more inspirational story than this celebration of reading in a time of war. This review originally ran in the December 23, 2014 issue of Shelf Awareness for Readers. To subscribe, click here, and you’ll receive two issues per week of book reviews and other bookish fun! By an interesting coincidence, I was just reading this article from The New Yorker: http://www.newyorker.com/magazine/2015/01/05/pulps-big-moment, which talks about the ASEs in the context of the history of paperbacks overall, and the important role they played. That’s interesting timing, yes, huh. It reads like a total coincidence?